Manual Tape Dispenser Simple tape length settings Dispense up to 30" of tape in one stroke Handles both paper and reinforced tapes - from 1 1/2" to 3" The Tape Shooter 333 Manual Tape Dispenser is the the industry standard for manual tape machines which makes it the best selling machine of its type throughout the world. This is not surprising, given its rugged and dependable design and simple tape settings that can produce tape lengths from 6" up to 30" in a single stroke. The versatility of this machine is also impressive since it can handle both paper and reinforced tapes from 1 1/2" to 3" wide. The mobility of this machine easily allows for its use throughout the workplace. The TapeShooter333 manual tape dispenser is the ideal choice for medium to light volume packing, and it is much more productive than the basic hand held tape guns. 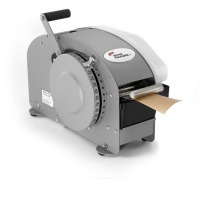 Boatman marking is sure to have the best Tape Dispenser to fit your individual packaging needs.